London South Bank University (LSBU) Law students met world renowned lawyers and legal campaigners at the launch of the Inspired by Law - A Gallery of and for Inspiring Lawyers event on Tuesday 17 November. LSBU students nominated 11 inspiring lawyers and legal campaigners to be part of the gallery, based on their dedication to human rights, the rule of law and social justice. James Thornton - an environmental lawyer and campaigner. Representatives also attended from organisations including Action Aid, Amnesty International, The Bar Council, Columbian Caravana and the Holocaust Memorial Day Trust. 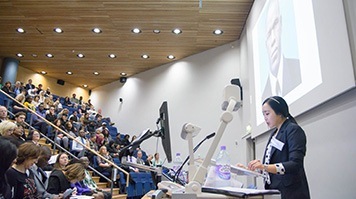 LSBU students presented to an audience of nearly 200 why they had nominated their inspiring lawyer based on the lawyer’s background, achievements and inspiring qualities. Each lawyer or their representative was given a copy of their gallery photo and profile by the student who nominated them. The lawyers and representatives then took part in a question-time-style panel discussion which covered the domestic and global themes of human rights, the rule of law and social justice. Discussion focused on the themes of the proposed repeal of the Human Rights Act, the International Criminal Court’s role in developing democracy, the promotion of women’s rights, and equality in the professions and the judiciary. They also included lessons from the holocaust, supporting human rights organisations, legal mechanisms for defending the environment and finally the individuals whom the lawyers themselves found inspiring. Both lawyers and the audience then had the chance to explore the gallery comprising the lawyers’ photographs and biographical details. Professor Craig Barker, Dean of the School of Law and Social Sciences commented, “The motivation for this event was to inspire a new generation of lawyers by acclaiming lawyers and legal activists who have really made a positive change in society.